Why AutoCAD is important? AutoCAD teaches you how to create and modify 2D and 3D geometry. Lessons and demonstrations cover beginner, intermediate and advanced topics including display controls, object properties, utility and inquiry tools, model documentation, collaboration tools and customizing your AutoCAD interface. 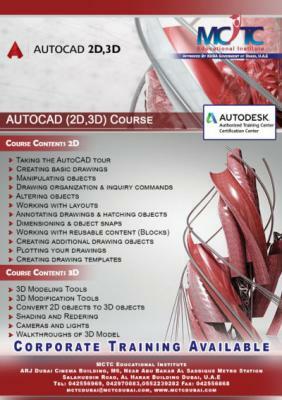 MCTC Dubai, an Autodesk authorized and certified training center in Dubai. We at MCTC Dubai offers a professional practical oriented training for all the Autodesk and engineering courses with certification since 2006. Free demo available for all the courses. Flexible timings. Affordable fees. Weekend classes available. Individual attention. Enroll today and start learning from the expert instructors in Dubai!